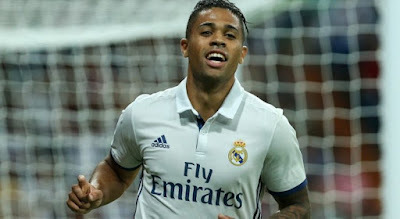 Former Lyon and now Real Madrid player Mariano Diaz has revealed he was advised not to wear Ronaldo number when he signed for the club. Mariano Diaz was once a Real Madrid player, but he was sold out because he was under performing. Diaz has however got out and become a better player. He developed very fast in Lyon and scored 21 goals in 42 appearances for the Ligue 1 side. Real Madrid however signed him back to the club during the summer transfer window. Diaz has however revealed he was asked not to pick the No 7 shirt on his return to the club because of the burden attached to it. Mariano Diaz is yet to make his debut for the club but will look to impress once he is called upon.